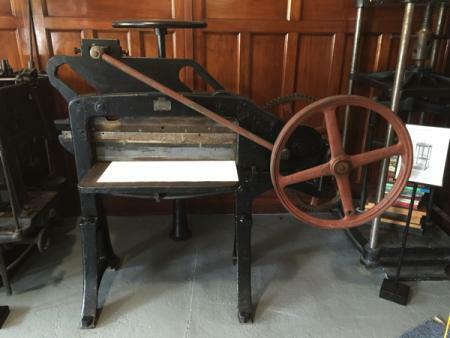 Apologies for using the Press and typeface identification forum for something that is not quite, but I wonder if someone can help us with dating this guilotine. We have just been donated this lovely old machine which we are guestimating is circa 1920s but maybe someone has more expertise? The serial no or build no is 14570. Cheers and thanks for any help. Yes 1920s is quite correct! redbeard45, You have a beautiful shop,are you a museum? The cutter looks to be missing the handle on the red flywheel. It is in the foyer of the Printery at the Ferrymead Historic Park in Christchurch, New Zealand. We have just completed a 6 week revamp of the foyer area in time for the 50th anniversary of the opening of the Park. Quite a bit more still to do but if you are in Christchurch, I would recommend a visit, even if I am a little biased! 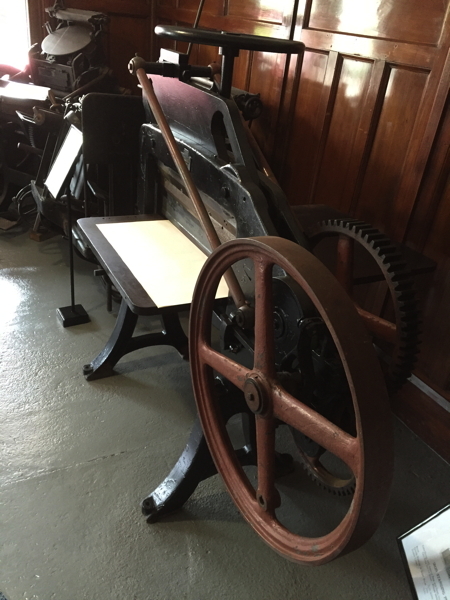 Also on display are an 1863 Albion (which visitors use with supervision to take away their own hand pulled poster), a 1904 Furnival ʻExpressʻ platen, a 1925 Heidelberg T platen, a circa 1900s C&P lever operated ʻPilotʻ platen, a 1890s Furnival Iron Standing Press (full height), a Model 14 Linotype, a Ludlow Type cabinet and a 1950s Kliscograph amongst a lot of other minor bits and pieces - well worth a visit if you are down this way. Thanks for the feedback and confirmation and yes, we believe the handle and other bits are missing - but it still makes a great display item. That is my last name! I am very curious…. Thank you for posting my image. It’s a page from the Etablissements Plantin in Bruxelles, a full subsidiary of Lettergieterij Amsterdam. 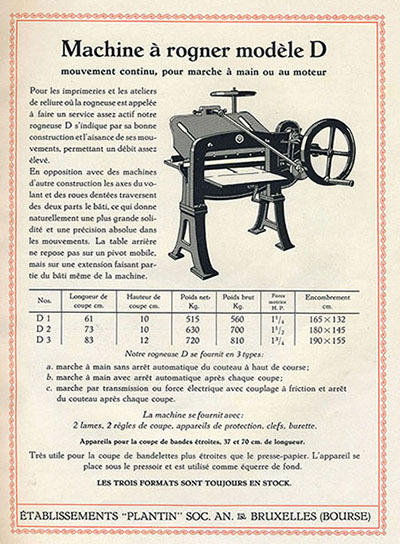 Most foundries sold printing equipment as well and often applied their own label/nameplate to the machines. I would be interested to see a photo of the small plate that is attached to your guillotine.